It can be a little hard to look back writer/director Wes Craven's original A Nightmare on Elm Street and see it with the required precision to separate it from its six and a half sequels. Through the course of Freddy's Revenge (1985), Dream Warriors (1987), The Dream Master (1988), The Dream Child (1989), Freddy's Dead: The Final Nightmare (1991) Wes Craven's New Nightmare (1994) and that half, Freddy Vs. Jason (2003), the franchise has had to mutate itself in increasingly odd ways in order to sustain itself. And given that the A Nightmare on Elm Street franchise supports itself on its central villain, Freddy Krueger, it's he himself has been necessarily mutated along with the franchise. As the subsequent films got more and more over the top, so did Freddy, and as his wisecracking and mischievous nature got cranked up, you couldn't help but start to like the guy. And that's the problem when trying to look back at the '84 original. Freddy has become such a towering icon of horror, identified with a series, and not one single film (as opposed to say, Leatherface, who will always be first and foremost associated with The Texas Chainsaw Massacre  above any other films in that franchise), that the Freddy's Dead version of Krueger is as equally identified with the character in the public consciousness as the original incarnation. And perhaps that what lends director Samuel Bayer's 2010 remake A Nightmare on Elm Street any legitimacy beyond an opportunity to spin a little more money out of such a well known and loved franchise. A remake allows us to strip away everything associated with the sequels and get back to the roots of the character. Much in the same way Casino Royale (2006) allowed us to separate Bond from a 57 year old Roger Moore swinging from the back of a fire engine in A View to a Kill (1985), the 2010 Nightmare on Elm Street allows us to separate Freddy from Super Freddy in The Dream Child. As mentioned above, Freddy has become unarguably one of the greatest characters in horror, no matter the format, standing shoulder to shoulder with the likes of Dracula and Frankenstein's Monster, who have more 'respectable' roots than an eighties slasher movie. So for that reason we really have to focus on the maniac himself. 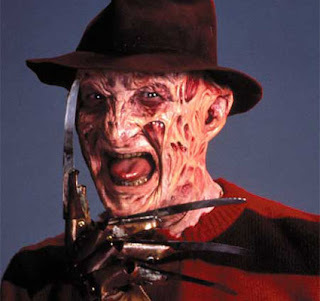 It would be easy to forget to praise the original Nightmare '84 for creating Freddy Krueger in the first place. Craven's creation is a masterpiece through and through and was breath of fresh air in a subgenre already overstuffed with masked murders slowly trudging after teenagers. His look is iconic, and its because of the thought that's gone into him; his trademark red and green sweater is of the two colours that clash most to the human retina, and its jarring just to look at him. Craven also makes the wise decision to make those colours particularly loud and bright, instead of taking the obvious route of making them dark, and it works effectively whenever he's onscreen; especially when Krueger is brought into the real world he seems particularly inharmonious with it. His badly burned face is also a result of Freddy's backstory, in which he was burned alive. While the quality of effects at the time might not have allowed for something really unpleasant to look at, this is a blessing in that it exaggerates the striking features of actor Robert Englund. 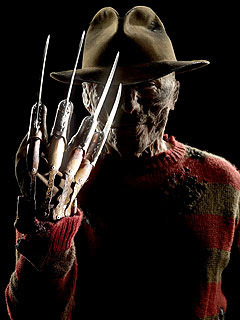 Finishing the trio of elements that really make Krueger stand out from his contemporaries is the claw. His bladed glove is a particularly evocative weapon and again is really fresh in a subgenre populated almost exclusively by kitchen knives. For Nightmare '10 however the filmmakers were hamstrung by the need to sufficiently deviate from the original look to validate the remake's existence, while retaining the key characteristics so as not to hack off the oh-so-loyal horror crowd. As a result they'd had to go the only way they could; grim. This Freddy '10 is sporting almost identical clothing; he has the red and green sweater, he has the crooked fedora, he has the glove and he has the burned face - everything is just 'grittied' up a good deal, meaning his sweater is no longer jarring to behold. While the glove is practically identical (the only person who ever got away changing that is Craven himself in New Nightmare) the modern attempt to make the face closer to that of a real burns victim doesn't work anywhere near as well as the original make-up. Whereas Freddy '84 is capable of sneering, malicious expressions, Freddy '10, played by Jackie Earle Haley, can't express anything. Without any lips to properly form words, yet his ability to, makes him seem like a particularly violent muppet. And unlike Freddy '84, his face isn't covered in distorted, stretched and damaged sinews. His strangely featureless and baggy face makes him looks like Mr. Blobby has had some incredibly aggressive liposuction. All in all Freddy '10 comes across like a disturbing Jim Henson creation. Playing him, again, Freddy '84 hasn't left Freddy '10 with many options. Robert Englund is the consummate lunatic, perfectly expressing Freddy's malice and absolute joy at hunting down, torturing and murdering his victims. And its not a grim satisfaction, Englund plays Krueger is an unmistakable giddy joy. Freddy '10, again, is forced to go the other way; the normally excellent Haley is forced to play Krueger as a dour, dark character that takes a more, adult form of pleasure in killing his game. Detrimental to the character, he becomes more conventional in his mannerisms and looses what makes his predecessor so subversive. It's just more obvious. It's obvious much in the same way that Nightmare '10 chooses to portray Freddy as explicitly paedophilic. It seems cheap, and doesn't explore society's preoccupation with paedophilia, merely it just feeds the sensationalism. Had it turned out that Freddy had not committed the crimes then it might have some warrant in its use in the subject. But as a studio-based remake with Michael Bay behind it, Nightmare '10 doesn't even have the excuse of being a low-budget, grimy exploitation film. Conversely there is a deceptive artistry in Englund's portrayal and the writing of Krueger in Nightmare '84. His paedophilic aspects are subtly present; be it from his nightmare in which he transforms Nancy's (Heather Langenkamp) phone into his tongue, reaching for her mouth and spitting "you're my boyfriend now, Nancy", or the very childlike, enthusiastic, playful nature Englund plays Freddy with. It's this over the top garishness that pervades Nightmare '84, lending it a surreally colourful quality that, as the film progresses, helps to blur the lines between reality and the dream world. The remake on the other hand merely tones things down in an effort to increase realism, but in doing so loses the very nightmarish quality with which the concept is trying to define itself with. It's an easy mistake to make, perhaps one the filmmakers of Nightmare '10 were forced into, but it renders its predecessor superior nonetheless. You can no better example for this than the fact that the gore has been toned down for the remake. The original contains sequences that are still powerfully violent and bloodsoaked, even to the hardened horror fan. Take the classic sequence in which Tina (Amanda Wyss) is crushed against the ceiling and the roof, leaving a blood slathered room in the aftermath or perhaps the most memorable death, in which Glen (Johnny Depp) is dragged into his bed by Freddy before he's regurgitated in a massive geyser of blood. Nightmare '10 copies Tina's death, but in the remake she's violently swung backwards and forwards, with comparatively little blood in sight, and as such, just doesn't pack the wallop we need the film to. The original film also effectively uses a two-level colour palette. The real world is decidedly bright and colourful, all brash neons. Meanwhile in the dream world everything is dark, grim and grimy. Nightmare '10, if making any stylistic capitulations, should have made this. Both the real and dream worlds have the same dark, grimy qualities. While the effects in the dream world are vastly superior, it still lacks the visual shock of going back and forth between bright and muted colours. The original A Nightmare on Elm Street is a classic that have unexpected layers which reveal themselves on repeat viewings. Tie that up with the birth of one of the greatest characters in all horror, and it was always going to be a hard film to remake. The remake is left having to bear semblance while choosing the options not taken by the original; but when nearly every option taken by the original was the right one, it's an exercise in self-sabotage.